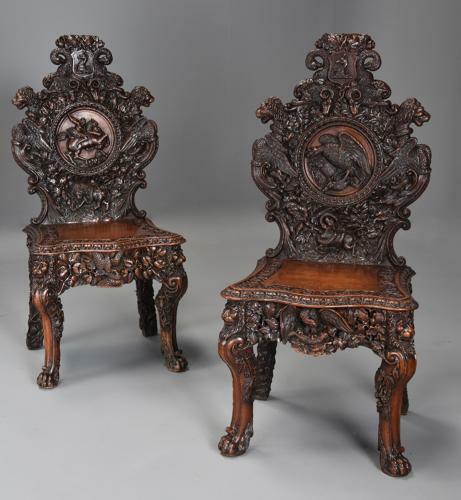 This pair of chairs consist of superbly and profusely carved backs with carved scrolling and foliate decoration to the top with carved armorial and carved birds to either side leading down to carved rams below with two finely carved lion heads on bird bodies with further foliate carving. The first chair having a central circular panel depicting a female on horseback, the horse being attacked by an animal with a carved lion below with further foliate carved decoration, the second chair having very similar carved decoration to the back with a carved central circular panel of a large eagle with a carved deer below. The shaped seats with foliate carving to the edge leading down to deep carved seat rails to the front and sides, the front rails having two carved eagles and foliate carved decoration, the sides with oak leaf and acorn carved design, the second chair with carved eagle and fish to the front seat rail, the sides with beech leaf and squirrel decoration. The legs all with carved lion masks to the top, the front scrolling legs with foliate carved decoration and terminating with a paw foot, the back legs having profuse foliate carving. The carving on these superb quality chairs is similar to the style of ‘The Warwick School of Woodcarvers’ who produced superb deep carved pieces of furniture during the 19th century. We understand that this pair of chairs were originally from a set of twelve chairs.